What caught my attention about the foot tapping, head wagging Motown classic song – It’s the Same Old Song – is discovering that it was recorded in 24 hours. From concept to recording to vinyl to first being played on the radio, the Four Tops had another hit song, right on the heels of their number one hit, I Can’t Help Myself (Sugar Pie Honey Bunch). Motown hit songs – there’s plenty enough for people to have a favourite or two. I’m convinced without even doing the research, that in 1950s United States, Motown music had a lot to do with white people taking another look, a closer look at Black people. Which brings me to Prison Songs. 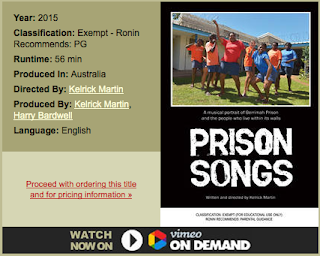 Prison Songs is a multi award winning documentary including Best Direction in a Documentary (Stand Alone) for Kelrick Martin at the 2015 ADG Awards. Screened earlier this year on SBS, this one hour documentary is now available for download rental for the price of a Motown classic. Prison Songs – Highly recommended. Astonishing achievement. And memorable songs with the expert guidance of singer/songwriter Shellie Morris. Do yourself a favour. We need a new song, a new way of examining the over representation of Indigenous people in jail. There are campaigns, hashtags, individual effort and collective advocacy... but just who is listening to what feels like the same old song? DISCLAIMER: I am not associated with any campaigns or crowd funding awareness raising efforts. We need more voices - I'm not looking to make up the numbers in the choir.